The “Best air mattress for guests” category is the “genesis”. This was their original purpose alongside camping and short-term solutions while moving. They’ve certainly gone a long way from that to being one of the most desired options for our permanent sleeping arrangement. As far as the models on our list go, nothing’s changed since the last update. SoundAsleep Dream Series still reigns supreme, followed closely by Insta EZ and Serta EZ . On the other hand, we’ve done a series of new tests on each and every one of these portable beds and came up with pretty interesting results. We’ve also gathered a lot of user feedback, mostly through personal contact with the recent buyers. All in all, we’ve got your back when it comes to keeping it up-to-date with the current market situation. Height 19 " 22 " 22 "
Now that we’ve seen our top 3 in this category bump heads, we can start with their dedicated digest reviews. I don’t think this guy needs any special introduction if you’ve ever gave a the market of airbeds a look in the last few years. SoundAsleep air mattresses have been dominating our ultimate guides ever since they hit the stage. They’re basically No.1 in every category they were eligible for, the company making these are only making a few models but they stand tall against any industry giant. Six months within this model hitting the market it was already labeled as “best air mattress“. Out of their 3 top-quality inflatable beds, Queen Size is the most impressive and the most sought after. Still as impressive and detailed as we remember it from the last update. The product specification might be the same, but the user reviews of this air mattress are fresh from the press. This portable bed has enough space for the two of us to sleep comfortably. We both like a firm sleeping surface because of our back problems, and this mattress keeps it firm all night long. ZERO air lost! I would like to see an auto shut-off function in this air mattress. It’s an excellent product, so why not pimp it up a little? As we already stated in our ultimate guide on best air mattresses for everyday use, SoundAsleep Queen Size got a bump in the comfort category. It’s “just” one point, but everything having to do with SoundAsleep products is on a much larger scale than with any other brand we introduce here. So, it’s kind of a big deal. We did some additional tests in the past two months, and you’ll be able to read all about it in our separate “testing-results” article due to be published soon. We think you’ll be surprised at our creativity this time around. We know we were. There’s not much to say about this model that we haven’t repeated over and over again. We know SoundAsleep a dominant brand pretty much since their Dream Series hit the market. It’s been going on for quite a while now, and it seems they’re not running out of steam as far as sales and customer satisfaction are concerned. Bottom line, when in doubt, go with SoundAsleep. If you want to feel proud in front of your guests as your bed deploys like a spider-machine from the future and want to hear praise in the morning about it not feeling anything like an airbed, an EZ airbed is probably something you seriously might consider. It’s the more expensive option (about double the SoundAsleep) price but many people find it, as one of our featured reviewers put it, simply cooler. OK, so let’s get the two main complaint out of the way – the pump and the bulk. Yes, this air mattress is heavy when packed. That’s why the carry bag has wheels. The manufacturers knew it was heavy. Honestly, with a massive steel frame like that, it was pretty much to be expected. As we already said, we’ll have to trade some weight for extra height and comfort. The main pump is loud, but we need it to do its thing once and let the NeverFLAT carry the baton. Some customers reported the uncomfortable indentations, which were “solved” with a cheap topper. On the other hand, positive sides of this portable bed are just too many to number. You’ve had a small glimpse in our PRO section, but you can always head out to Amazon and read some more. So, this is one solid piece of inflatable furniture, period. It’s no wonder it holds the 2nd position this whole time. If we’re honest, and we always try to be, it’s probably never gonna catch up to the SoundAsleep representative, but the perpetual 2nd place is nothing to sneeze at either. This is a very similar model to the one we’ve just talked about, so you can expect a slight feeling of deja-vu from our last mattress in this update. Product specifications between the two also look alike a lot. So, let’s see if the customers have equally positive experiences. Best temporary bed I got for sleepovers I owned so far. We’ve had 3 different air beds, and they’ve all left our guest room quicker than they entered. They all bit the dust after just a couple of uses, but this one is different. We bought it 3 months ago, and it’s been slept on for 10+ times. No leaks, no sagging… Perfect! It’s our spare mattress for about a year now. It’s been slept on countless of times, and it’s still going strong. There are no signs of wear, the connections are still holding, and it’s still very comfortable. Great value for the price! The mattress is very supportive. It keeps my back perfectly aligned, and it has almost eliminated the pain I used to feel every single morning. Not to mention sore muscles and stiff shoulders. All of that almost completely gone! Serta and Insta EZ beds are very similar products, as we already mentioned. Thus, the PROs and CONs are similar as well. Everything we heard about Insta applies here too. The CONs are almost identical. So, the main deciding factor between these two was the amount of copies sold. People just seem to dig Insta more for some reason. They had similar test results as well. What we’re trying to say is, whether you opt for Insta or Serta EZ, you’ll end up with the same product basically. They even look almost the same. 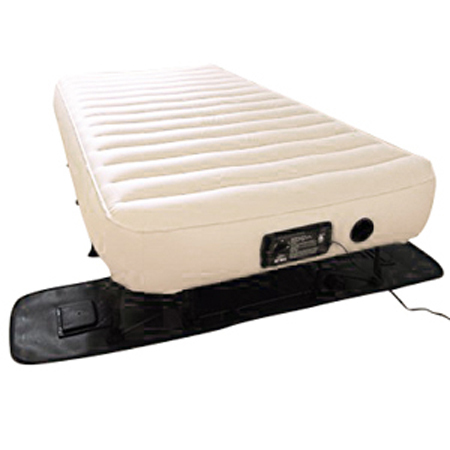 So, this air mattress is tried and true as far as we and diligent customers are concerned. We hope you enjoyed the read as much as we enjoyed putting it together for the past two months. We’ll complete the story with extra test results soon, both in-house and coming from our featured testers. There were no “fireworks” this time in terms of placement changes, but we sure hope something dramatic happens in time for the next guide. Highly unlikely, judging by the past few updates, but one can hope, right? Sleep tight and see ya in 2 months.